One of the greatest volcanic eruptions in recorded history occurred approximately 3,650 years ago in the eastern Mediterranean region, then the cradle of civilization. Santorini is a small, elliptically shaped archipelago of islands, approximately 10 miles (16 km) across, located about 70 miles (110 km) north of the island of Crete. The islands are dark and ominous in stark contrast to the white limestone of the Greek islands, and they form ragged, 1,300-foot (390-m) peaks that seem to point up toward something that should be in the center of the ring-shaped archipelago but is no longer there. The peaks are pointing inward toward the center of a giant caldera complex that erupted in the late Bronze Age, approximately 3,650 years ago, devastating much of the eastern Mediterranean. The largest island on the rim of the caldera is Thera, and across two circular 900-1,000-foot (275-300-m) deep calderas rests the opposing island of Therasia, once part of the same volcano. In the center of the composite caldera complex are several smaller islands known as the Kameni Islands, which represent newer volcanic cones growing out of the old caldera. Santorini and Thera (present-day Thira) are part of the Cyclades islands that form part of the Hellenic island/continental-margin volcanic arc that stretches from western Turkey through Greece, lying above a subduction zone in the Mediterranean along which part of the African plate is being pushed beneath Europe and Asia. 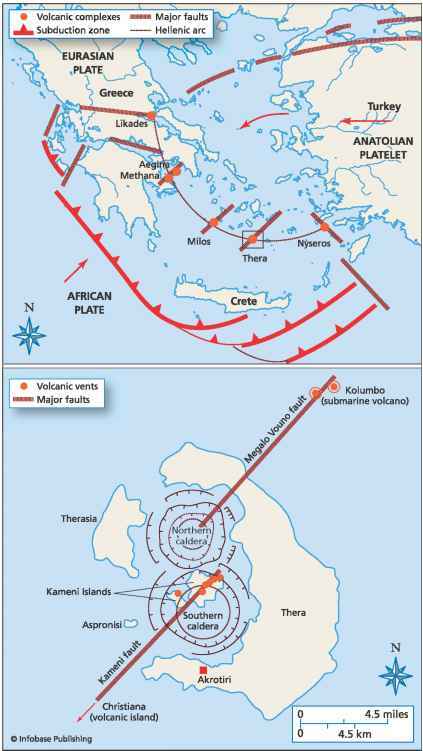 Volcanoes in the Hellenic arc are widely spaced, and numerous earthquakes also characterize the region. The area was apparently densely populated before the massive eruption 3,650 years ago, as remnants of Bronze Age and earlier Neolithic settlements and villages along the coastal Aegean are buried in ash from Thera. Settlers that arrived about 6,000-7,000 years ago and traded with Crete and Greece populated the island of Thera. In 1967 archaeologists discovered a Bronze Age city buried by ash from the eruption, and uncovered numerous paved streets and frescos, indicating that the city was at least the size of Pompeii, Italy, when it was buried by the eruption of Vesuvius more than 1,700 years later. At the time of the eruption the region was dominated by the Minoan culture, derived from Crete. The eruption occurred while a primitive form of writing was used by the Minoans, but has not been deciphered, and the Greek language had not yet been codified in writing. Thus no local texts record the eruption, although Hebrew text was in use in nearby Egypt and Israel. Some scholars have tried to link the eruption of Thera with biblical events such as the plagues, days of darkness, and parting of the Red Sea during the exodus of the Israelites from Egypt, although the timing of the eruption seems to be off by a couple of centuries for such a correlation to be made. 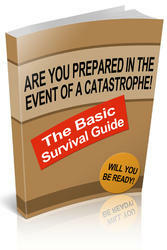 The best current estimates for the age of the eruption are between 1690 and 1620 b.c.e. Map of the eastern Mediterranean (top) showing the tectonic setting of Thera in the Hellenic volcanic arc. Note that Thera is located along a major fault above a subduction zone. Detailed map (bottom) of Santorini archipelago, showing modern Thera and the large calderas that collapsed 3,650 years ago. Before the cataclysmic eruption, the santorini islands existed as one giant volcano known to the Greeks as stronghyle (Strongule), or the round one, now referred to as Thira. There are no known written firsthand accounts of the eruption of Thera, so the eruption history has been established by geological mapping and examination of the historical and archaeological records of devastation across the Mediterranean region. Volcanism on the island seems to have started 1 to 2 million years ago, and continues to this day. Large eruptions are known from 100,000 and 80,000 years ago, as well as 54,000, 37,000, and 16,000 years ago, then finally 3,500 years ago. The inside of Thera's caldera is marked by striking layers of black lava alternating with red and white ash layers, capped by a 200-foot (60-m) thick layer of pink to white ash and pumice that represents the deposits from the cataclysmic Bronze Age eruption. Ash from the eruption spread over the entire eastern Mediterranean and also fell on North Africa and across much of the Middle East. The most violent eruptions are thought to have occurred when the calderas collapsed and sea water rushed into the crater, forming a tremendous steam eruption and tsunami. The tsunami moved quickly across the Mediterranean, devastating coastal communities in Crete, Greece, Turkey, North Africa, and Israel. 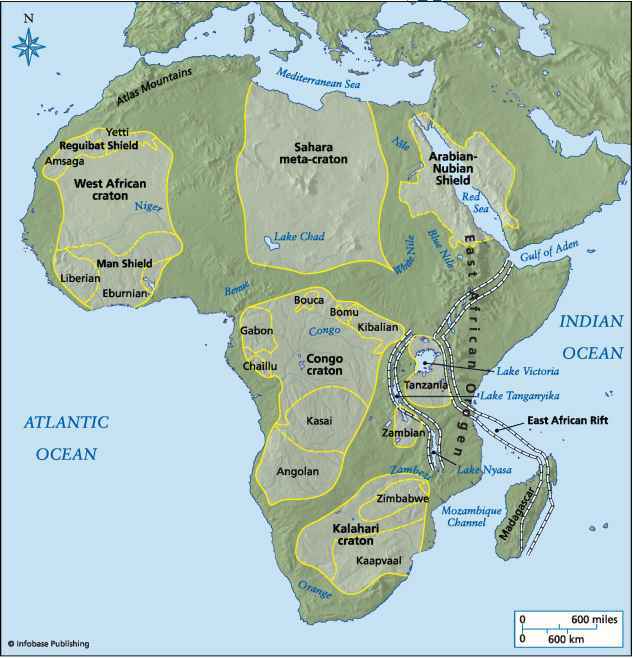 The tsunami was so powerful that it caused the Nile to run upstream for hundreds of miles (several hundred km). Detailed reconstructions of the eruption sequence reveal four main phases. The first was a massive eruption of ash and pumice ejected high into the atmosphere, collapsing back on Thera and covering nearby oceans with 20 feet of pyroclastic deposits. This phase was probably a Plinian eruption column, and its devastating effects on Thera made the island uninhabitable. Approximately 20 years passed before activity continued, and some settlers tried to reinhabit the island. Huge fissures in the volcano began to open during the second phase, and seawater entered these, initiating large steam eruptions and mudflows and leaving deposits up to 65 feet (20 m) thick. The third phase was the most cataclysmic and followed quickly after the second phase, as seawater began to enter deep into the magma chamber, initiating huge blasts that were heard across southern Europe, northern Africa, and the Middle East. Sonic blasts and pressure waves would have been felt for thousands of miles around. Huge amounts of ash and aerosols were ejected into the atmosphere, probably causing several days of virtual darkness over the eastern Mediterranean. The fourth phase of the eruption was marked by continued production of pyroclastic flows, settling many layers of ash, pumice, and other pyroclastic deposits around the island and nearby Aegean. Most estimates of the amount of material ejected during the eruption fall around 20 cubic miles (80 km3), although some estimates are twice that amount. Ash layers from the eruption of Thera have been found in Egypt, Turkey, other Greek islands, and the Middle East. Thera undoubtedly caused global atmospheric changes after ejecting so much material into the upper atmosphere. Data from Greenland ice cores indicate that a major volcanic eruption lowered Northern Hemisphere temperatures by ejecting aerosols and sulfuric acid droplets into the atmosphere in 1645 b.c.e. Additional evidence of an atmospheric cooling event caused by the eruption of Thera comes from tree-ring data from ancient bristle-cone pines in California, some of the oldest living plants on Earth. These trees, and other buried tree limbs from Ireland, indicate a pronounced cooling period from 1630 to 20 b.c.e. European and Turkish tree-ring data have shown cooling between 1637 and 28 b.c.e. Chinese records show that at this time there were unusual acidic fogs (probably sulfuric acid) and cold summers, followed by a period of drought and famine. The eruption of Thera therefore not only destroyed the Minoan civilization, but also changed atmospheric conditions globally, forming frosts in California and killing tea crops in China. The eruption of Thera seems to coincide with the fall of Minoan civilization, certainly in the santorini archipelago, and also on Crete and throughout the eastern Mediterranean. The cause of the collapse of Minoan society was probably multifold, including earthquakes that preceded the eruption, ash falls, and 30-foot (9-m) high tsunamis that swept the eastern Mediterranean from the eruption. since the Minoans were sea merchants, tsunamis would have devastated their fleet, harbor facilities, and coastal towns, causing such widespread destruction that the entire structure of the society fell apart. Even vessels at sea would have been battered by the atmospheric pressure waves, covered in ash and pumice, and stranded in floating pumice far from coastal ports. Crops were covered with ash, and palaces and homes were destroyed by earthquakes. The ash was acidic, so crops would have been ruined for years, leading to widespread famine and disease, driving people to seek relief by leaving Crete and the homeland of the Minoan culture. Many of the survivors are thought to have migrated to Greece and North Africa, including the Nile delta region, Tunisia, and to Levant, where the fleeing Minoans became known as Philistines. Where is the island of thera on a map?